Purchasing a hot tub can be very confusing. Every sales person has a different story to tell and it often contradicts what another person told you. How do you sort through this mess? When you don’t know much about a product, it’s easy to default to the stat sheet and compare number of jets, number of pumps, etc. This is a trap that could lead you to a very poor hot tub purchase decision. Let’s start with the number of jets. What is the right amount of jets? Are more better? Not all hot tub jets are created equal. While some are designed with specific targeted muscle therapy in mind and have the perfect air to water ratio (eg, Bullfrog Spas patented JetPaks) others are simply cheap nozzles that spray water. Many hot tub companies will load their spas up with a bunch of small, cheap, bullet jets that offer little to no massage therapy. This way, the stat sheet shows a large number of jets and will often dupe unsuspecting people into thinking it is a better spa. For this example, I will compare Bullfrog Spas to ThermoSpas. On the left above are just 3 examples of the many different jet therapy options available to choose from when you purchase a Bullfrog Spa. On the right is an image of a fully loaded, $16k ThermoSpa. The Oscillator Jetpak above only has 4 jets versus the dozens in the right. If you based your decision on jet count alone, you’d be sorely dissapointed (pun intended). After 23 years in the industry, I have felt the jets from most hot tub manufacturers. Bullfrog’s oscillator jets do a “figure 8” pattern on your back with the perfect mixture of air and water. They are my favorite jets I have ever felt. The vast majority of the jets in the Thermo Spa are the cheap little bullet jets that offer very little in the way of therapy. There are a whole lot of them but I would personally choose the 4 oscillator jets hands down, every time. I would the seat with 4 jets, over the seat with dozens of jets. Let that sink in. Another tactic that companies use is to put “air only” jets and use them to pad the jet count. Most reputable manufacturer’s have stopped putting air only jets in their spas. The air blowers are loud, cool down the water (drastically reducing energy efficiency), and offer virtually no therapy to the bather. Most objective industry veterans will agree, you are much better off avoiding a hot tub with an air blower. 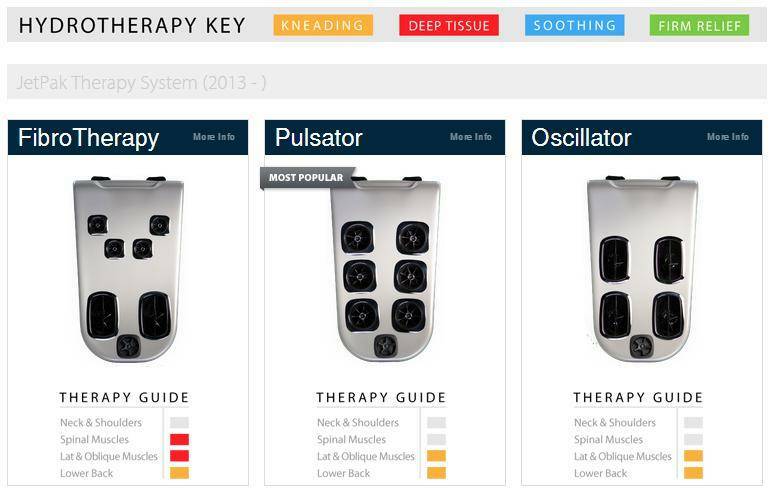 The tactics above are used mostly in spas that are sold through non-traditional means, like big box stores. Thermo Spas does not have a dealer network with showrooms where you can see the spas. They send commission only salesmen to your house with pictures and brochures. Naturally, when you can’t first see the spa, kick the tires, and sit in it, you will default to the stat sheet to make your judgement. 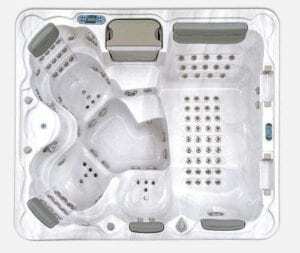 This spa may sound great on paper with so many jets, but if you were to sit in it side by side with a more therapeutic hot tub like an Artesian Spa, you’d feel a significant difference in the therapeutic value of Artesian’s patented Helix Jets versus Thermo Spas bullet jets or air jets. In my personal opinion, it’s a night and day difference but I encourage you to wet test before buying to make a more informed opinion. By the way, you can’t do that with a Thermo Spa or when purchasing from a big box store. Additionally, some hot tub jets have multiple nozzles per jet. For example, the Pulsator JetPak in a Bullfrog spa has 6 jets with 2 nozzles per jet that rotate creating a karate chop type massage feel. Some unscrupulous hot tub manufacturers will count the number of nozzles as individual jets, further inflating the jet count so as to look more enticing on paper. Another dishonest tactic that should be cause for concern with the way this company decides to do business. What about number of pumps? Should this factor in to your decision on what hot tub to purchase? This ones not so simple. For example, the same companies that use air jets will count the air blower as a pump. This is pure deceit and not done by most reputable companies. Additionally, some models have a dedicated circulation pump (circ pump) whose only job is filter and circulate the water for heating and ozonating purposes. While this pump has a benefit, it should not be conflated with providing additional horse power or jet power. Another factor to consider in jet power and pump number comparisons is the efficiency of the plumbing designs. A spa with 2 big, powerful pumps can significantly under-perform when compared to a single pump spa if it is poorly plumbed. The more plumbing in a spa, the more friction that must be overcome in delivering the water from the pump to the bather’s muscle tissue. Sharp 90 degree plumbing elbows create much more friction loss than soft 90’s or gradual radius elbows. Eliminating twists and turns, using larger diameter pipe, and special manifolds can significantly increase jet performance. In other words, more pumps does not necessarily equate to better jet performance. Well that’s enough information for part one of our hot tub buyers guide. See part 2 for more details on how to navigate the hot tub shopping experience and make an informed decision.